Regarded as the first British prime minister and if fact was the first PM to reside in 10 Downing Street. The third son of a family of seventeen, he was educated at Eton and Cambridge, and inherited a country estate aged 24 which gave him the wealth necessary to enter politics at the time. In 1701 he became the Whig member of Parliament for Castle Rising, Norfolk. He proved himself an excellent speaker, and rose rapidly within the party. He was made a member of the Admiralty Board, Secretary of War and, in 1709, Treasurer of the Navy. Although he did suffer a setback in 1712, when the ruling Tories had Walpole tried for accepting an illegal payment as Secretary of War. Found guilty, he spent six months imprisoned in the Tower of London. However, when the Whigs regained power, Walpole quickly rose to the positions of First Lord of the Treasury and Chancellor of the Exchequer. Walpole resigned amid party infighting in 1717, splitting the Whigs in Parliament, but in 1720 returned to the government as Paymaster General. Appointed as Chancellor of the Exchequer and First Lord of the Treasury for a second time, Walpole's powers as prime minister date from this point. Walpole was quickly successful, neutralising dangerous opponents, reducing the national debt and stabilising prices and wages. His influence stemmed from his popularity with both the King and the people. Although he probably also effectively used bribery and corruption to retain power. After George I's death in 1727, Walpole was supposed to have been replaced by King George II's favourite, Spencer Compton. Walpole managed to show due sycophancy to the new King who reappoointed him as PM once more. It was at this time that 10, Downing Street was given permanently to the office by the King. 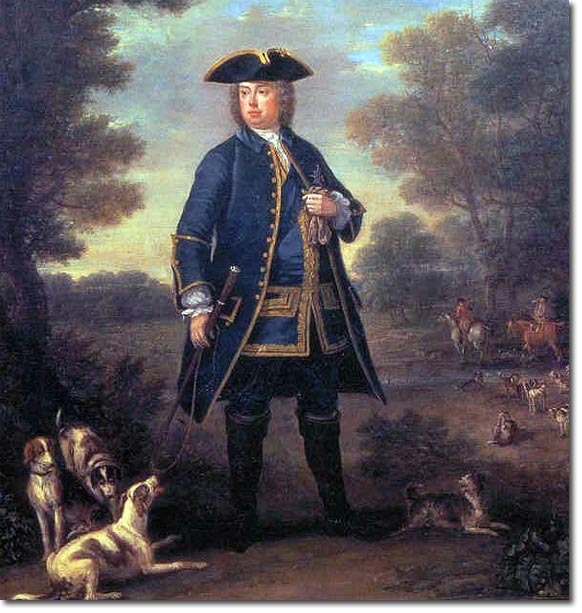 In 1739 Walpole's poor performance in a war against Spain reduced confidence in his ability to carry out his duties. A disappointing general election result in 1741 made his position even more precarious. Walpole was forced to resign as prime minister in 1742, and was elevated to the House of Lords. An enquiry was launched into the distribution of secret service money under his premiership, alleging corruption but the matter was never resolved.